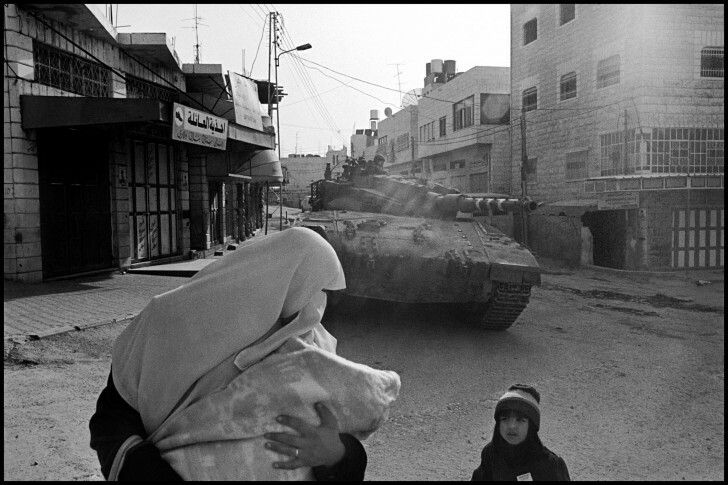 On May 31st , after meetings at the Henri Cartier-Bresson Foundation in Paris, the jury of the HCB Award nominated Larry Towell as the 2003 winner for his project “The walls of no man’s land: Palestine”. Presented by the Henri Cartier-Bresson Foundation, the HCB Award is a prize of 30 000 Euros to stimulate a photographer’s creativity by offering the opportunity to carry out a project that would otherwise be difficult to achieve. The HCB Award is made possible by the support of the bank NSMD and NSM Vie (ABN AMRO Group) who reinforce their policy towards contemporary art. Larry Towell’s business card reads only “Human Being.” He is also one of those rare photojournalists who, like Robert Doisneau, travels reluctantly and only when the subject is very important to him. Towell was raised in a large rural family, the son of an autobody repairman. As a teenager his father once scolded him for wanting to drive to Florida with a friend. It was too far from home and he would be corrupted by the distance. While Towell studied visual arts at York University in Toronto (1972 -1976), he was given a camera and taught how to process black-and-white film; and he brought the camera home, because there was no place on earth he wanted to photograph more. During a stint of volunteer work in Calcutta in 1976, he began photographing and writing, questioning the distribution of wealth, and issues of land and landlessness. When he returned, he supported himself and his family teaching folk music for several years. In 1984, he also became a freelance photographer and writer, focusing on the dispossessed, exile, and peasant rebellion completing projects on the Nicaraguan contra war, the relatives of the “Disappeared” of Guatemala, and US Vietnam veterans who had returned to help rebuild war-damaged Vietnam. His first published magazine essay, Paradise Lost, was about the ecological consequences of the Exxon Valdez catastrophe in Prince William Sound, Alaska. Experience as a poet in the 1970’s, and as a folk musician in the 1980’s did much to shape his style. Everywhere he travels he concentrates on intimacy. In 1997 he completed a major story on the Palestinians. In 1996 he completed a project based on ten years of reportage in El Salvador. His fascination with landlessness simultaneously led him to the Mennonite migrant workers of Mexico, a eleven year project. He is currently finishing a reportage of his own family in rural Ontario where he lives and sharecrops a seventy-five acre farm. Larry has exhibited broadly in Europe and North America and his work is housed in major collections. His reportage has appeared in magazines that include: The New York Times, LIFE, GEO and Stern. Larry has been the recipient of photography Awards that include several World Press and Pictures of the Year Awards, a Eugene Smith, the Oskar Barnak, Roloff Beny, Alfred Eisenstadt, and a Hasselblad Award.